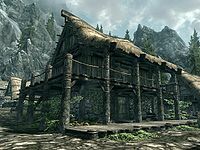 The Riverwood Trader is a small general trade store located in Riverwood. The store sells a variety of weapons, clothes, armor, and other items. It is run by local shopkeeper, Lucan Valerius, and his sister, Camilla Valerius. Lucan usually displays a beloved Golden Claw decoration on the counter. When you first encounter them, the claw has been stolen by the thief Arvel the Swift. If anything happens to Lucan, Camilla will take over running the store. * Only becomes a merchant if Lucan Valerius is dead. In front of the shop are some piles of firewood, several barrels of food, and a cart filled with cabbages. At the rear are a flight of wooden stairs leading to the balcony above. In the southern corner of the downstairs room is an L-shaped counter which Lucan stands behind when he is in the store. In addition to the displayed merchandise there are four loose gold coins on the countertop as well as the Golden Claw, once you have retrieved it. 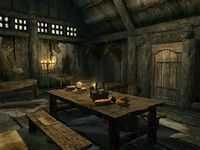 Under the counter is a small coin purse, and hanging from the ceiling are two bunches of dried elves ear, a bunch of frost mirriam, a garlic braid and a rack holding three rabbits. Against the southwest wall is a cupboard and set of shelves filled with more displayed merchandise, while against the northwest wall is a barrel, an unlocked chest and a dresser containing clothes. Opposite the front door is a fireplace with a cooking pot on a stand in front of it. In front of the fireplace is a round wooden table and chair where Camilla sometimes sits when she is in the store. There are two bottles of wine, a loaf of bread, and a wedge of cheese on top of the table. To the left of the fireplace is a rack hanging from the ceiling holding two pheasants with a food barrel underneath and a set of shelves to the left holding only clutter. The stairs leading up to the residence above are against the northeast wall with a pile of firewood and some more food barrels underneath. Upstairs there are two owned single beds in the southern and western corners, with a dresser and round wooden table between them. On the dresser are three common books and on the table are two bottles of alto wine, a common book and three loose gold coins. At the foot of both beds are novice-locked chests containing minor loot. In the center of the room is a long wooden table with three bottles of alto wine, several loaves of bread, and pieces of cheese. Against the southeast wall is a set of shelves holding an iron mace and more clutter. In the northern corner, over the stairs, are a couple of unusable barrels and a square wooden table, with a door leading outside onto a balcony overlooking the main road through town. All low-value items in the store can be freely taken once you have completed The Golden Claw quest. 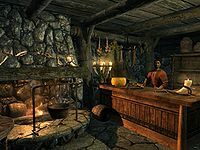 Before The Golden Claw is completed, the Riverwood Trader will remain open all day, every day, and Camilla and Lucan will never leave the store or sleep. Game files suggest Riverwood Trader was named Whiteriver Trader sometime during development. It is possible to invest in the Riverwood Trader so that the merchant's available cash can be permanently increased to up to 10750 gold.